Typing this blog entry is difficult. Not emotionally difficult, mind you, physically difficult. I've spent a large portion of the last five days running around, moving furniture, cleaning rooms, painting, and assembling new furniture. The assembly has been the roughest part as it has required a great deal of screws being turned leading to my forearms feeling like they are on fire. It was kind of like that World's Strongest Man competition where they had to twist a pulley to lift a weight in a race against each other. Well, maybe it was a little less grueling. 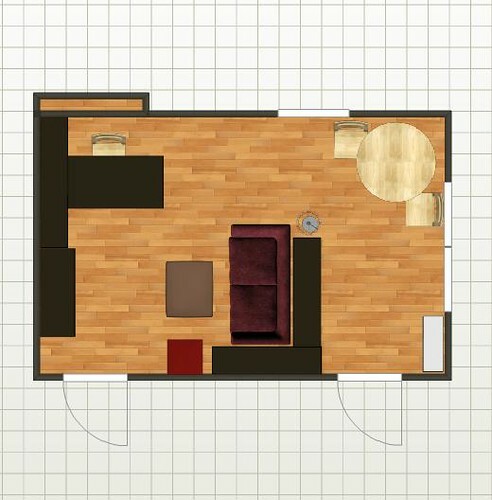 We had to move tons of stuff from one room to another so we could paint, then we had to shuttle stuff back and forth between rooms to allow for our new floor plans (done up courtesy of Jen's uncle Gregg) to be realized. In the midst of all of this the plumbing for our shower broke which meant we had to have plumbers here for 8-10 hour days for the past two days to repair everuthing to fix the water which was exploding about. 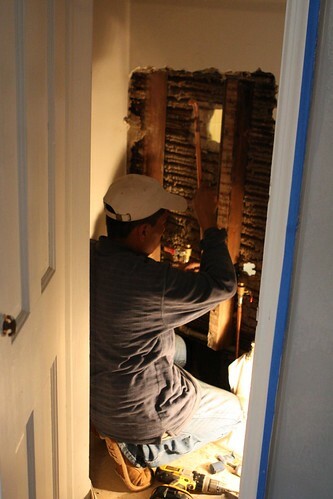 They had to break through the wall on both sides leaving one closet unusable and adding a tremendous amount more dirt and disarray to a room that was already in rough shape. 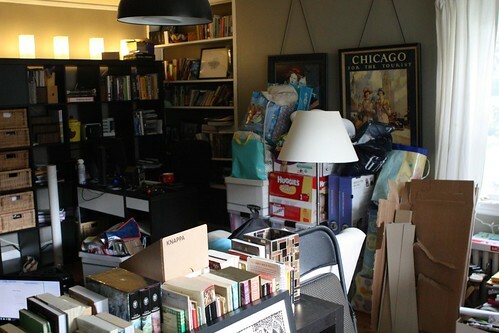 After they left I was able to clear up enough stuff to almost make our apartment liveable. Since I was able to clean all the lamps, guitars, and desks out of the kitchen I was able to make my way to the stove to throw together something simple but home-cooked for dinner. 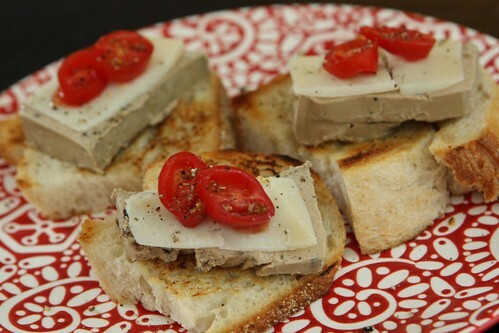 I started by putting together these little treats with leftover bread that I grilled with butter and olive oil then topped with truffle mousse, Spanish cheese, and grape tomatoes. This was mostly to use up the leftovers in the fridge but it turned out to be quite delicious. It's been in the fifties and raining so the week of grilling so far has not gone according to plan. 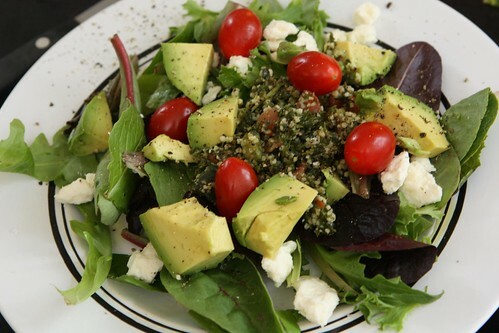 For salad I again threw together some leftovers with mixed baby greens, avocado, tomato, feta, and tabouli. I was just going to sear and roast a beautiful piece of cod that I picked up but I pretty much mangled it beyond repair when I flipped it. In an effort to distract from the destroyed fish I threw in some tomatoes, olives, and artichoke hearts. 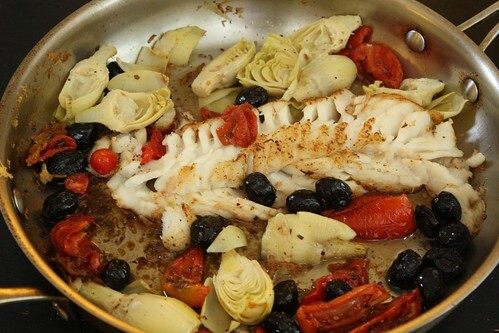 Pay no attention to the wrecked fish in the center of the pan. 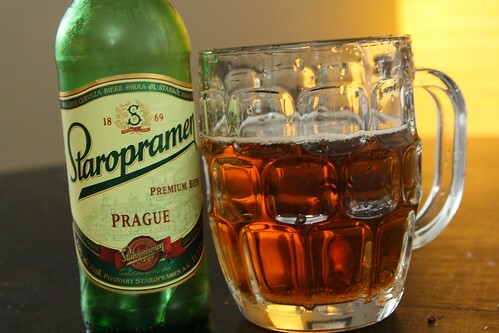 For beer I had this Staropramen from Staropramen Brewery in Prague. This beer was pitched to me as being better than Pilsner Urquell. A Czechoslovakian woman at the store had not tried the beer before but she did give me a kiss when I located a stray six pack of Pilsner Urquell for her. I had not been expecting that. in the 1990s but it didn't make it into his awesome show The Beer Hunter. When Jen's mother and sister visited us this weekend for her baby shower they made a large batch of caramel corn. I saved a large amount of the leftover sauce which had bits of popcorn and Marcona almonds in it and used it as the basis for this ice cream sundae with some vanilla ice cream, whipped cream, and maraschino cherries. 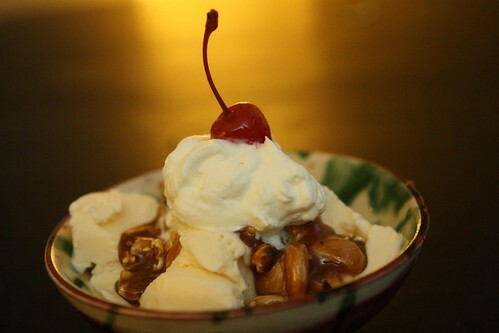 The sundae was a triumph, the perfect balance between sweet and salty. The only issue is that I have about a quart of this sauce left. I need to figure out what the heck I'm going to do with all of it other than having four or five of these sundaes a day. Maybe instead I will figure out an alternative use for all of this. Perhaps it would work well as a spackle to seal up the giant hole in our wall!